Chelsea captain John Terry will not be joining Manchester City this summer, the London club have insisted. City boss Mark Hughes has made his continued interest in the England defender clear, despite having a recent £30m bid for the 28-year-old rejected. 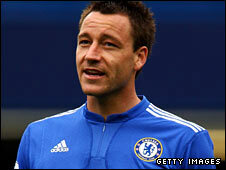 But Chelsea chief executive, Peter Kenyon, said: "He's not available at any price. "He's got a three-year contract. He's told us he doesn't want to go and we don't want him to go. End of story." And Terry was at Stamford Bridge on Wednesday as Chelsea announced they have extended their sponsorship deal with Samsung until 2013. The statement from Kenyon comes after Hughes confirmed that he was interested in signing the defender. Terry has had his fair share of injuries these past few seasons and who would not wish to "nurse" his way to the World Cup by playing less games? "We think we could offer him a different challenge," said Hughes, who saw Terry as a youngster when the ex-Wales boss was a striker at Chelsea. "When you have been with a club a long time, you get to a point when a change of scenery could reignite you." Hughes spent the majority of his career at Manchester United before moving to Chelsea in 1995 for £1.5m. He scored 39 goals in 123 appearances over three seasons for the west London club, while Terry was coming through the youth system. "I have fantastic respect for John Terry, ever since I saw him as a young player when I was at Chelsea as a player myself," added Hughes. "He's a great player and an outstanding captain but he's very much a Chelsea player at this moment in time." City have reportedly offered Terry a £200,000-a-week deal, but Hughes stressed that money would not be the deciding factor. "It's not a question of finance, or money, it is about a different challenge," he said. "It is about John being at a different stage in his life and career, and maybe that is why there hasn't been a response (to commit himself to Chelsea) because John is seriously thinking in those terms. "I went through that process as a player and I can understand if that is the way he is thinking."